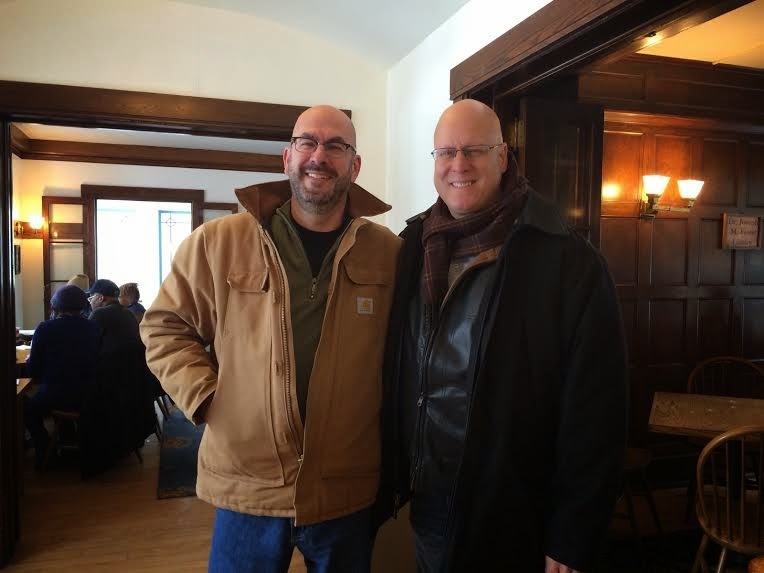 Yesterday, I went and had coffee with one of my old fraternity brothers / roommates. I'm not 100% sure what possessed me, but he was in town taking his son to a college visit and he was free for hours on a cold cold day. I guess curiosity got the better of me. The year I moved into the fraternity house, I lived with Pat for most of the first year. Yesterday, he says he saw the house not long ago and our room was quite small, but I don't remember it that way. It wasn't spacious by any means, but it was not small. Both Pat and I were thinner. Both of us had hair. While I wasn't out at this time in my life (well at least to anyone in my house), Pat seemed to have this confluence of gay-dom around him, even though he was (and is) straight. His big brother in the house was a flamboyant dance major. Yes, nothing says "gay" like a dancer named Jorge. Pat's roommate before me was named Terry. Somehow, someone found Terry's stash of Blueboy magazines and he kind of fled from the house. That left a room open for me - another gay man in Pat's immediate existence. I spent more than a few nights on the sofa in the living area of the house, as Pat would leave a tie on the doorknob. That frustrated me, but what kind of tramp would even want to sleep over in a fraternity house? I mean - c'mon - show some self respect. Whore! But Pat brought his wife yesterday - whom I had never met. And while we didn't talk a lot about ourselves today, it was more reminiscing which stands to reason. It was more about re-establishing our baseline. I mean, he asked about and was genuinely interested in 710, which was nice. He asked if this girl who really liked me in college ever got over her crush. Me, being me, gestured to myself and said, "c'mon - does anyone really ever get over this???" It was good for a laugh. But it looks like his son will be coming to college less than a mile away from where we live, so the potential to see Pat is greater than it has been for the last three decades. Before we parted, and while his wife was using the powder room, I made mention to Pat of Jorge, Terry and myself. He was light-hearted about it all and said, "well you know my dad was gay (I did not know that), so that pretty much makes me half-gay." He went on to say how is dad claimed (humourously I'm sure) that he invented gay. It was a nice way to end the visit. I'm left wondering if it was Jorge (sounds like George) or Jorge (sounds like Whore-hay). this was a lovely post; I am glad you two have each other.